Welcome to the first day of the JustUs Geeks War Report countdown to All Out War. Throughout this ten article series we will be covering all the information you need to know leading into All Out War. 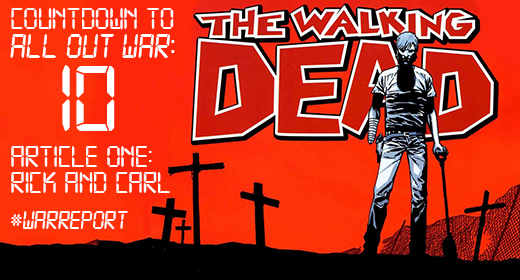 Without further ado lets get to talking about The Walking Dead. One of the most engaging relationships in The Walking Dead is also one of the longest running. Of course, I am referring to Rick and Carl. No characters have evolved and changed as much as these two and their relationship reflects this. While their love for each other has never diminished, they have often had major conflicts, mostly due to Carl’s violent nature and Rick’s need to protect Carl. Even though we do not see Rick and Carl together until the end of issue 2, Rick’s drive to find Carl and Lori is a major part of the drama that makes issue 1 great. From the very beginning we see that Rick is willing to go to any length to be with his family and protect them. This theme runs deep through every subsequent arc in the series. Rick will do whatever it takes to protect Carl. It would almost be foolish to think that this will not play a role in All Out War, especially considering Negan’s desire to kill Carl after Carl “wounded” Lucille. Not to mention that Negan knows that threatening Carl can make Rick react irrationally. Carl quickly demonstrates in the series that he is not a normal child. Just as it has changed the adults, the zombie apocalypse has changed Carl. When Carl kills Shane, Rick’s former best friend, he not only demonstrates his willingness to protect his family, like his father, but also that he is becoming unhinged, also like his father. This is the first of a series of events showcasing Carl’s willingness to commit violence in the name of the greater good, and until Carl’s admission of murdering Ben, after watching Rick and Abraham slaughter a band of thieves, this willingness often drove a wedge between him and his father. Rick often lamented that Carl should still be able to be a child in spite of the zombie outbreak. Carl wanted nothing more than for his father to view him as an adult. Even after arriving in the Alexandria Safe-Zone, one of Rick’s goals with assisting the community was for Carl to have a normal childhood. Instead, they quickly learned that their experiences in the prison and on the road had matured Carl past the point of being a normal child. When Carl is accidentally shot in the face by Douglas, the former leader of the Safe-Zone, Rick once again is filled with hope that the Safe-Zone could be a permanent residence, implying that Carl could have a normal childhood there. Despite this, Rick begins to treat Carl more like an adult after Carl recovers from his wound. Carl’s belief that he should be treated like an adult and his affinity towards violence does put him in harm’s way twice in the initial conflict with the Saviors, first when he attacked the Saviors in their own base and then when he shoots at Negan, “wounding” Lucille. We have seen that while Negan was impressed with Carl’s assault at the Savior base, he now wants to kill Carl. With Carl’s aggressive nature, and Rick’s desire to protect him from Negan, he is in an interesting position for the upcoming war. Carl is the character that is most likely to be a loose cannon. Rick will most likely want to keep Carl out of any direct conflict once the war has started, but Carl will most likely do everything in his power to get involved. It is not unusual for Carl to take action against his father orders, and his hatred for Negan would make him even more prone to disobeying his father’s orders if it means he can get a shot at Negan. Rick and Carl’s relationship is set to be one of the center pieces of All Out War, not only because it always has been up to this point, but also due to their different ideologies on how to deal with Negan. Rick, despite his impromptu and failed assault on Negan, is approaching the conflict with a fair amount of logic, while Carl is impulsive and childlike in his approach. At some point in the arc it would not be surprising to see the two in conflict with each other on how to handle certain aspects of the war. If Kirkman decides to take that route it would not surprise me if Carl were to die in this arc. The guilt caused by the death of Carl shortly after a confrontation between the two could easily send Rick into a downward spiral, much like Lori and Judith’s deaths did after the prison. Regardless of how Kirkman decides to handle the Rick and Carl dynamic during All Out War, I cannot shake the feeling that their relationship will be forever changed. We have seen them clash before, but with the stakes as high as they are in this war, their differences could actually decide the outcome of the war. Could Carl’s impulsiveness put Rick’s army in danger? Could Rick’s need to protect Carl prove a hindrance? We will have to wait and see. Have you heard the latest episode of The JustUs Geeks Podcast? Listen here or find us online! Ronnie McNutt is the co-creator and major contributor of Oddball Gaming. You can find out more about oddballgaming.net. Hey, Hey, it’s YOUR Birthday, Josh Steen! Tommy King liked this on Facebook.